Laid-back neighbourhood haunt Ari may be off the beaten track, but it comes with everything you’d expect from an up-and-coming area, not least a long line in artisanal coffee shops. Read on to find out where to eat, sleep, drink and shop there. 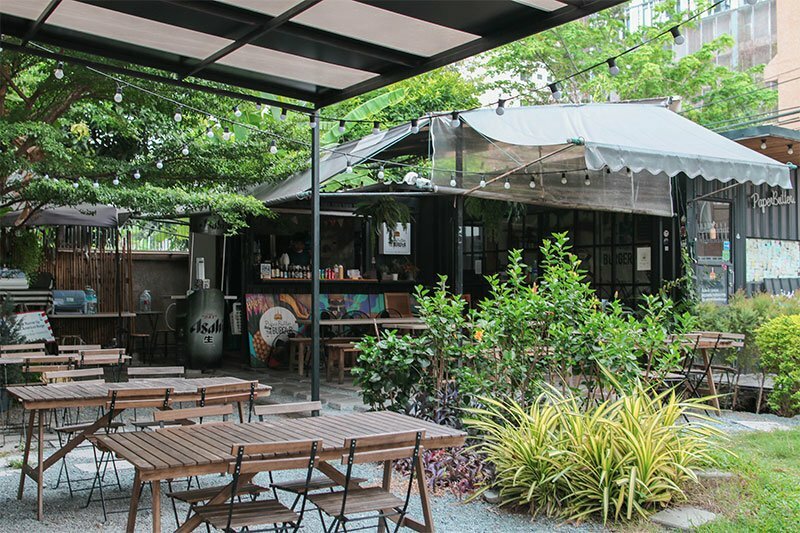 Just a 30 minute drive or a hop on the Skytrain from Bangkok’s Business District, the indie vibe of the city’s Ari neighborhood brings something different to the party. While most parts of Bangkok have rushed to modernize in a fast-paced, fast-changing city; the old Thai style houses, simple lifestyle and small shops of this cosy neighbourhood stand in stark contrast to the rest of chaotic city life. On the one hand, in the back alleys of this tucked away enclave, time seems to have stood still thanks to its traditional Thai architecture. On the other, the main streets of the neighborhood have been brought back to life with quirky cafes, restaurants, bars and modern condos that are fast attracting a crowd of hipsters, coffee hunters and young urbanites. More developed than an old town but less hectic than a modern neighborhood, Ari is something Bangkok has been longing for. Better known as a residential area outside the reaches of the city’s financial and social hubs, the Ari district of Bangkok has recently witnessed a boom as a large number of investors and entrepreneurs have looked to escape the skyrocketing rents of the city centre and start up homes and businesses in a place unfazed by modern city life. The blend of old residential homes and happening bars and cafes is what keeps the area interesting, attracting both locals and expats who form part of a strong community that’s given the area a new lease of life. Take a walk through the streets and you will find a mixture of roller skaters, dog walkers, cyclers, coffee enthusiasts and artists as well as a fun crowd by night, bringing a varied and vibrant feel to the streets around them. As this new community has grown, so have the businesses that serve it. Unlike many other areas in they city centre that are filled with big corporates and franchises, Ari celebrates independents, traditional shophouses and small-scale cafes and restaurants where customers can get involved in the community and enjoy the area’s entrepreneurial passion. Far from the more glitzy names that dominate the who’s who of Bangkok’s dining and social scene, Ari is, in some ways, a link to a more authentic experience, yet still one rooted in up and coming ideas, new ventures and a big international influence. Here’s our list of the top spots worth checking out there. Tucked away in the leafy residential area of Ari, Some Time Blue offers drip coffee, espresso-based cups, and fruit blends made by award-winning drip coffee specialist Sutida Srirungthum. One of her bestsellers is the Gravity Latte, where cold coffee slowly seeps into a glass of cream. With its classic and victorian furnishings, Some Time Blue imparts a warm, welcome feeling that goes hand in hand with their coffee. Wakey wakey! This is a haven for morning hipster souls looking to escape the hustle of Bangkok’s bustling city centre. Just like its name, Common Room X Ari is a communal place where coffee talks are always serious talks. What really draws the crowd in is their freshly baked goods and impressively diverse coffee menu. For a lazy morning, why not try pairing their charcoal waffle with vanilla ice cream or their salted yolk custard with their renowned espresso on milk cream rock. We promise you won’t be disappointed. A European style bistro and a great spot for brunch or lunch, this cafe is all mid-century modern furniture and sleek leather banquettes, giving you an elegant yet relaxed place to refresh and recharge. A brasserie style menu, central bar and some standout deserts make this a good place to kick back with the papers and watch the world go by in style. With a gorgeous outdoor terrace and sleek, minimalist restaurant design that makes the venue very Ari friendly, Pla Dib has been luring a diverse and devoted crowd for years now as a longstanding feature on the Ari dining scene. The eatery puts a clear focus on traditional Thai fare served with subtle hints of Japanese and European flare. Their signature dish Salmon Larb, featuring raw salmon with a spicy dry rub, is truly incredible and draws regulars back every time. They also opened their own aquaponic greenhouse in 2016, growing their own vegetables for their farm to table fare. Lauded by many as Bangkok’s best burger joint, Paper Butter and the Burger has four delectable types of burger on offer: The Paper Butter And The Burger, The Aloha Hawaiian, The Chiangmai Spicy, and The Very Cheese Burger. Many feature their signature black, charcoal infused buns – but for those on a diet, fear not, there is also a bun-free, low-carb option to satisfy your cravings. With the cool, breezy feel of a backyard barbecue, Paper Butter and the Burger is the perfect spot for a relaxing evening of beers and burgers, and be sure not to give the curly fries a miss! Part bike shop, part cafe, here’s a hipsters paradise. The Thai outpost of Japanese bicycle brand Tokyobike, known for their retro inspired, cute and colourful designs, this Ari hangout also sells cycling accessories (stylish ones, of course,) and has an in house coffee shop serving great homemade ice cream and patisseries. Ari’s hip yet affordable small hotel brings sleek decor to Bangkok’s budget hotel scene. Situated just 2 km from the city’s famed Chatuchak Weekend Market, Josh Hotel boasts a range of elegant rooms, a candy coloured outdoor pool and smart, slick furnishings, all of which bring an upscale feel to this cost-effective hangout. It’s also home to its own Thai restaurant Marigold, and plays host to the area’s coolest ice cream parlour, Hello Summer (see below). As probably the best spot in Ari to cool down from Bangkok’s 40 degree heat, this new addition to the hippy neighborhood is a must try. Situated in the chic and stylish Josh Hotel, the ice cream parlour is already making its name for serving one of the best classic soft serve delectables (89 THB) that comes in 2 flavors – “White Sand” (creamy milk) and Flamingo (strawberry yogurt). Besides the freshly made ice cream and milkshakes, this small little shop also could not be more perfect for instagram-worthy photos. Perhaps one of the tiniest cafes in the neighborhood, this pink painted venue is our go-to slow-bar coffee shop in the Ari neighbourhood. Highlights include filtered coffee with lychee and rose, thai drip and their cocoa latte. Regulars also return almost daily to savour their best-selling coconut cake. With such a small space, the cafe focuses on grab-and-go orders and pocket-sized cakes, ideal for those on a time crunch. With its rainbow coloured, Day of the Dead inspired decor, and its speciality tacos and beers. Who could ask for more? Throw in its stewardship by Danish specialist brewers Mikeller, a 12 strong tequila menu, latino vibes and bold Mexican food and you’ve got a super fun spot for a night out.